count, sort, compare and ...DON'T PUSH THE BUTTON! Our Press Here book project led us to activities filled with buttons. 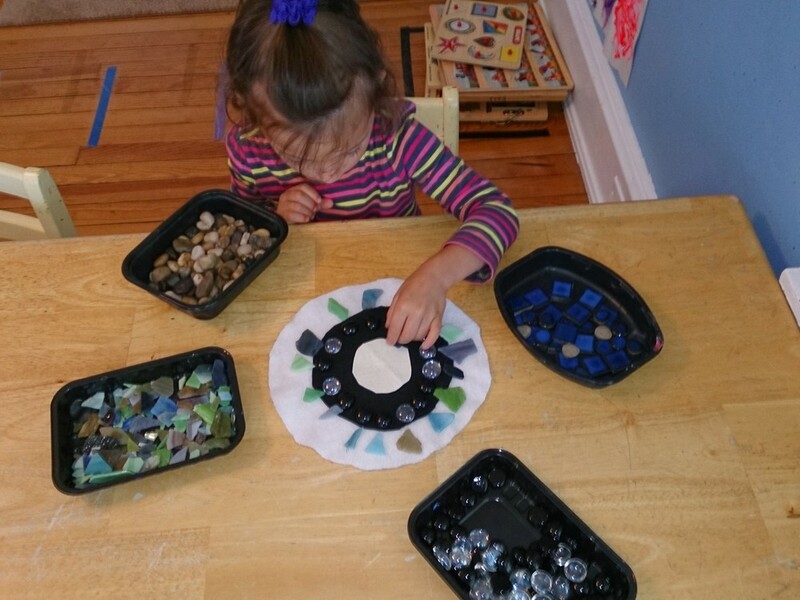 We began by sorting buttons into different categories: color, size, texture, # of holes, etc. 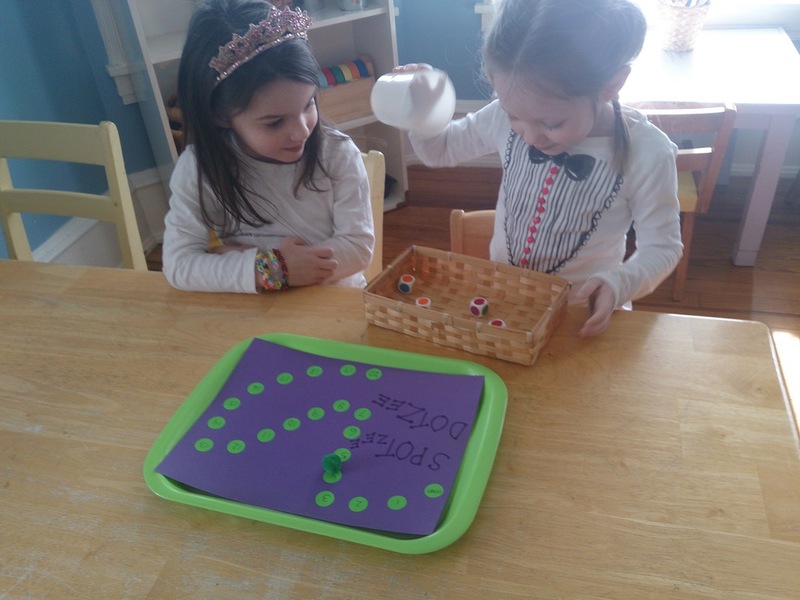 A simple game was presented when dice were added to the sorting trays, and the Fireflies worked on recognizing number patterns without having to count individual dots. When buttons were hidden in the play dough, the children counted up to 60 as they kept track of the number of buttons they found. 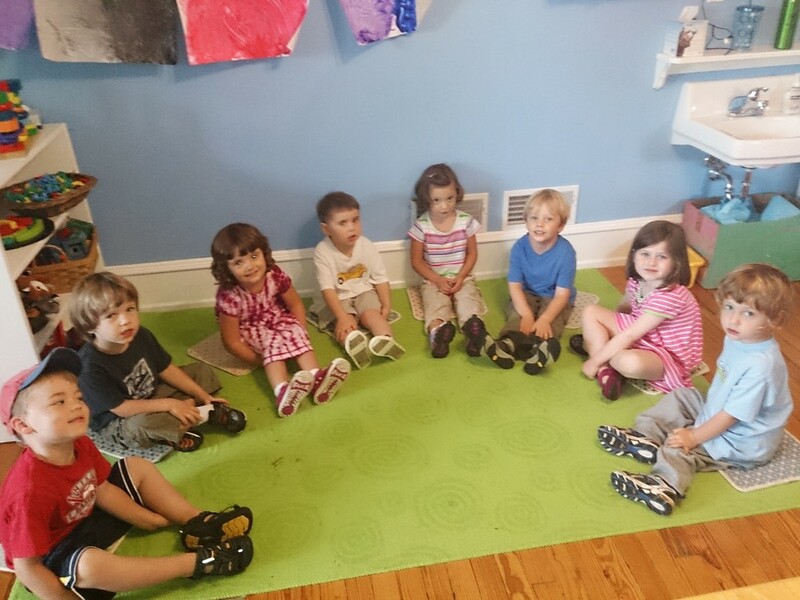 At Circle Time, each child picked a button and was paired with another child. 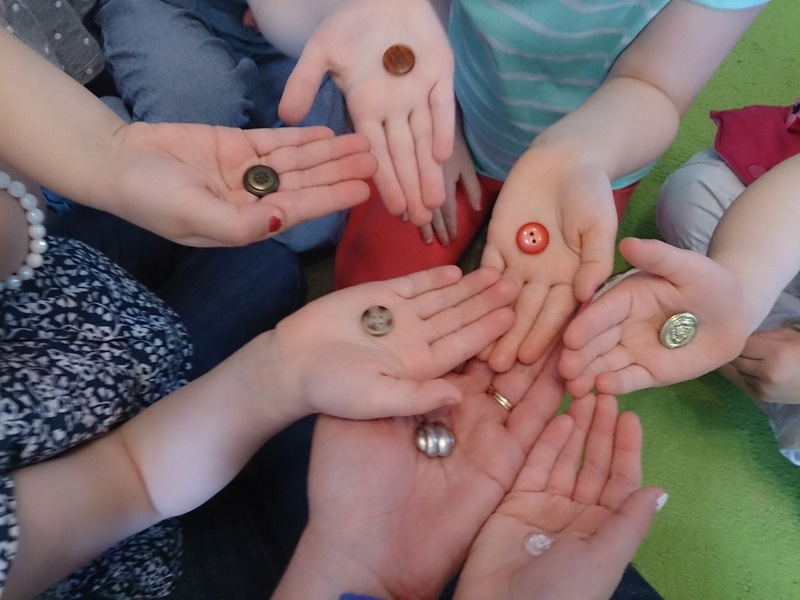 Each pair compared their buttons and had to find something that was the same and different about their buttons. This task proved to be a difficult one! The Fireflies created button collages that are now on display in the hallway. We expanded our button theme and read books about push buttons, and discussed elevator buttons, radio buttons, TV remote buttons, etc. 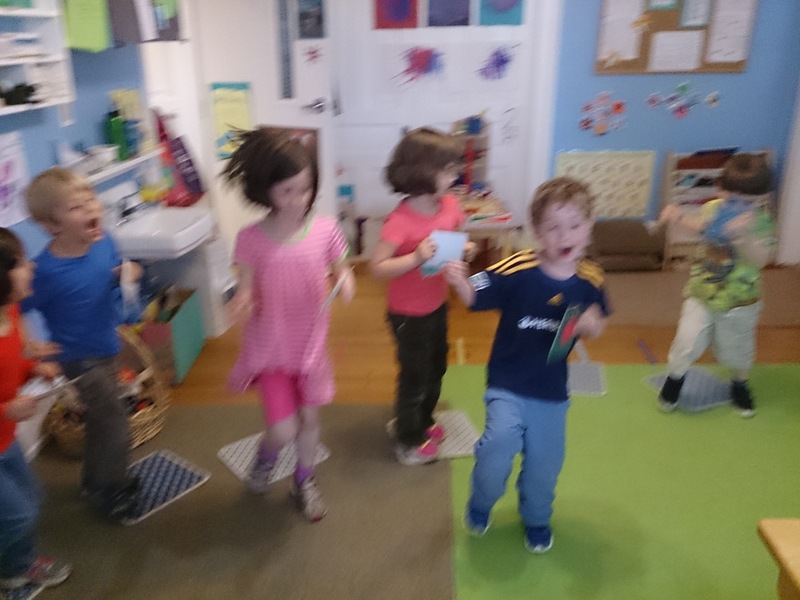 We even had a freeze dance party and every child got to press a push button to make the music stop and go. 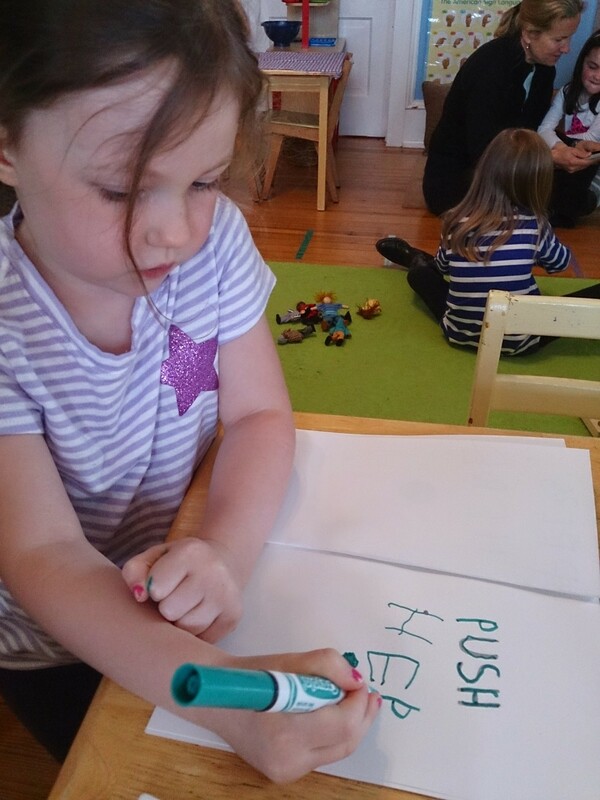 We also read Push Button by Aliki at Meeting for Worship and asked the question, "At home, what do you like to do after your electronic play time? When you are tired of watching TV, playing on an Ipad, or a game on mom and dad's phone, what do you do?" "There's only one rule in Larry's book: don't push the button. Okay, quick. No one is looking... push the button. Uh, oh." Larry the monster turns yellow with purple spots! He multiplies! I love reading this book and the Fireflies were hooked by the title before I even opened the book. After the story, I brought out a red button of my own and told the children that when I pressed the button, it would make me jump and pretty soon the children were jumping with me. Then each child got to press the button and tell the class what would happen, "When I press the button, everyone will roll on the floor!" or "When I press the button, everyone will reach really high!" We were having so much fun, we hardly wanted to break for lunch. 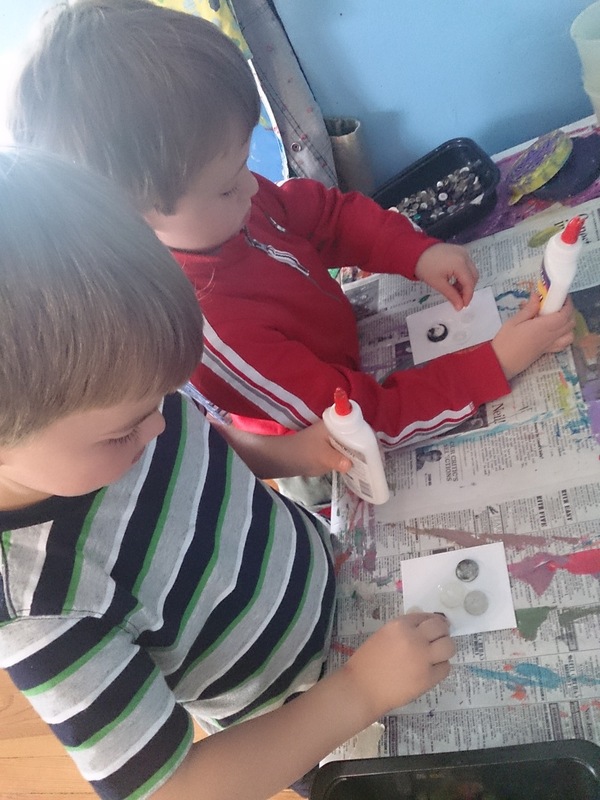 Upon returning from lunch, the children were delighted to discover that they could make their own push buttons. Both classes spontaneously started their own child led Don't Push the Button Circle Time which lasted for over 30 minutes! 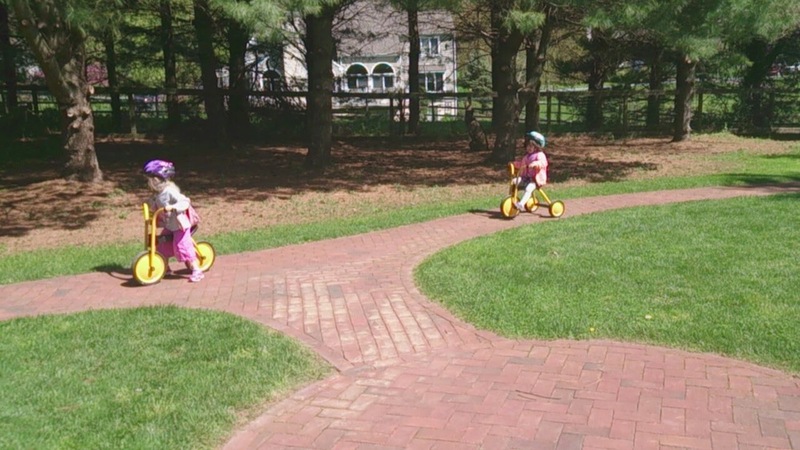 Encourage your children to share their Push Button game at home if they haven't already. an artwork for the Annual Art Show. After Spring Break, we started a book project inspired Press Here by Herve Tullet. The class was given this book as a gift at the beginning of the year and when the book is on our bookshelf the children gravitate to the magic of this book. The video on the left is an excerpt from the book. The Firefly children are truly delighted by this book and soon we are laughing and giggling with the whole class gathered around the book as a teacher reads it. We read the book at circle time and each child decided what color their first circle would be and how it would change when the page was turned. After our group time, each child sat with a teacher and giggled as they decided how their book evolved. 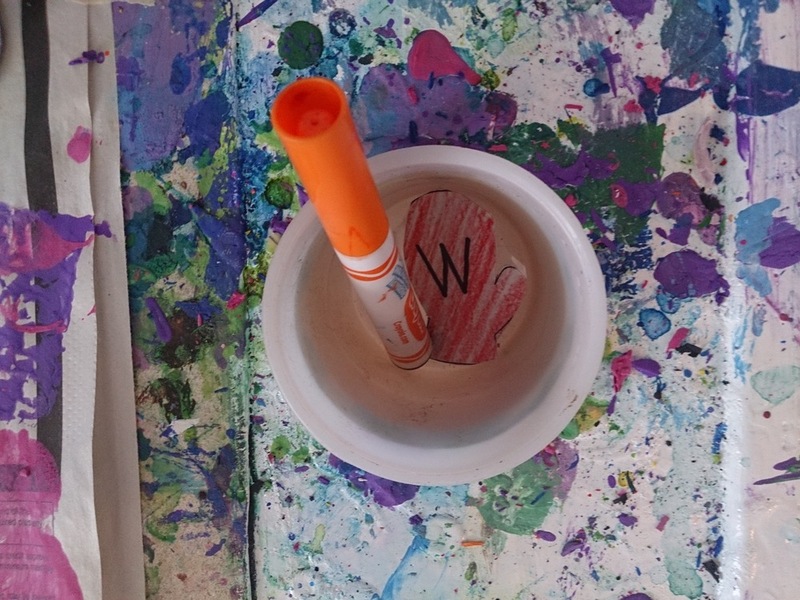 Printing letters, proper hand grasp and letter recognition were some of the skills that each child developed during this activity. When complete, child and teacher read the book with amusement. I was hoping the children would put their books on our class bookshelf, however, the children were so excited to bring their projects home right away! were excited to find the mittens. After finding a mitten, they would rush to the table to find a matching letter! 27 wooden dowels are placed within a wooden ring and then twisted so they balance on the table. Players roll a colored die which determines which dowel they must remove from the ring. The Fireflies worked cooperatively to to see how many sticks could be remove before the structure collapsed! 24 sticks was the record! They didn't even know they were practicing thier number skills their number skills! Number Skills are fun! Roll Five colored dice to see how many green circles are facing up and move your spot to the same number of dots on the game board. Recognizing numbers 1-20 was embedded in to the game as well as some simple addtion. The children were slightly irritated when they would roll for several turns and not get any greens, so we made a whole new board and played Spotzee Dotzee Blue to see if we would have better luck. One group did achieve a Spotzee Dotzee(All five of dice were blue! ), most groups noticed the same unlucky stretches in Spotzee Dotzee blue and Green. 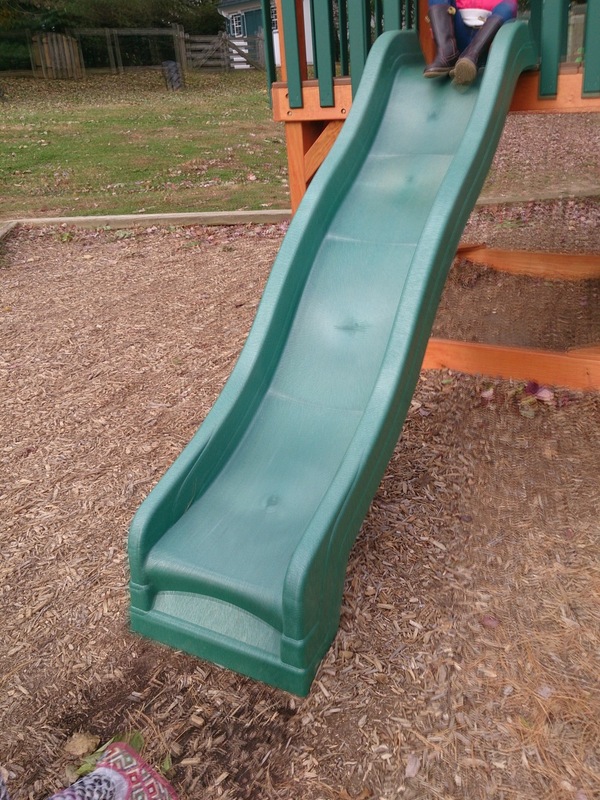 This Game was a popular in either color! But it's warm in here! 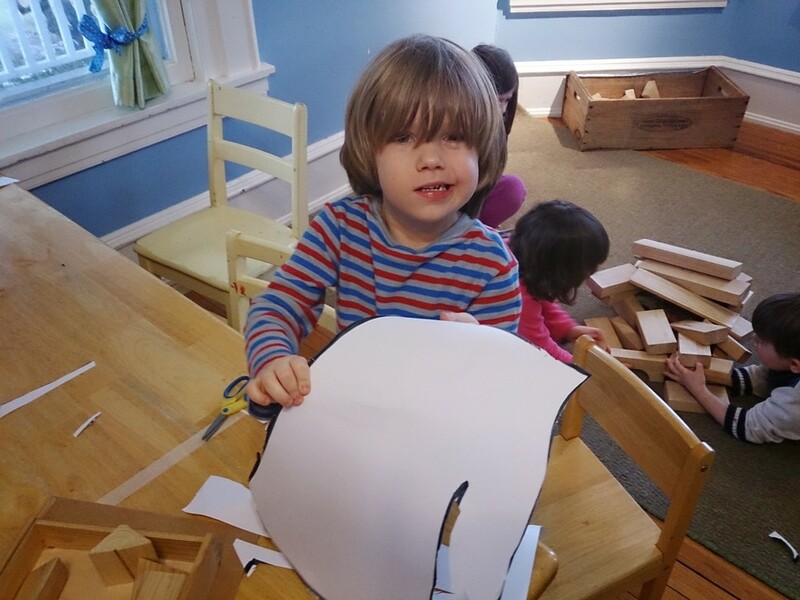 The frigid temperatures may have kept us inside our first week back, but we had plenty to keep us busy! The cold inspired us to read the The Little Kittens and then at circle time we had to find the match to our lost mittens. 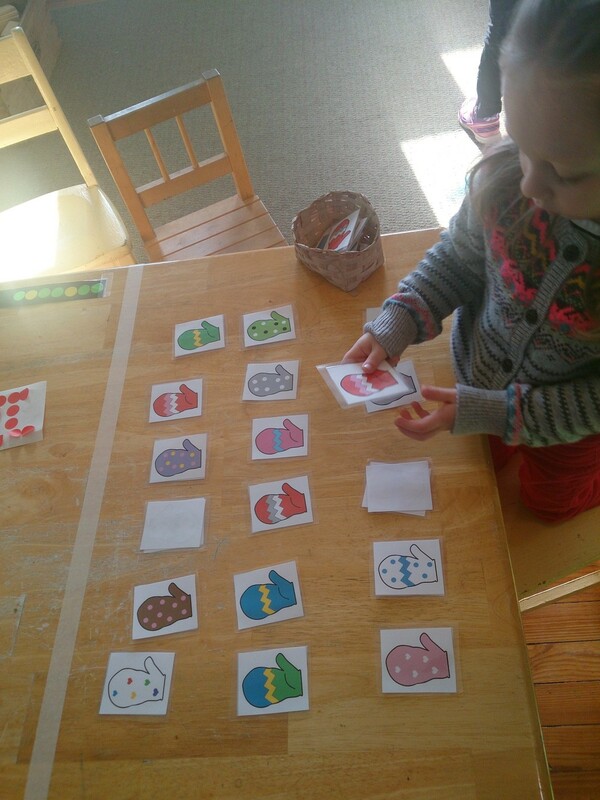 Each child was given two picture mitten cards but they were mismatched, then each child had to identify another child had one of the mittens that they needed. Instead of pointing at the matching card, each child had to use describing words to obtain a match. This simple activity proved difficult but the Fireflies were up for the challenge. We also read, The Mitten by Jan Brett at circle time. As we read the book a second time at snack, we discussed the different vocabulary found in the book. Bulging, burrowed, jostled, talons, commotion were just a few of the words that your children defined! To practice our scissor skills, each Firefly then cut out their own big stretched out mitten, but we painted it so it wouldn't get lost in the snow. 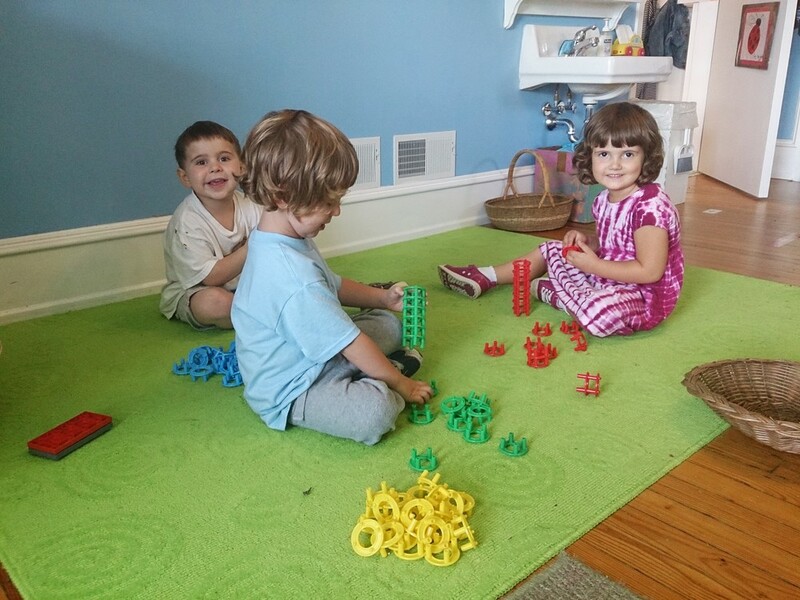 The MWF children got to visit the meeting room to play with the blocks. 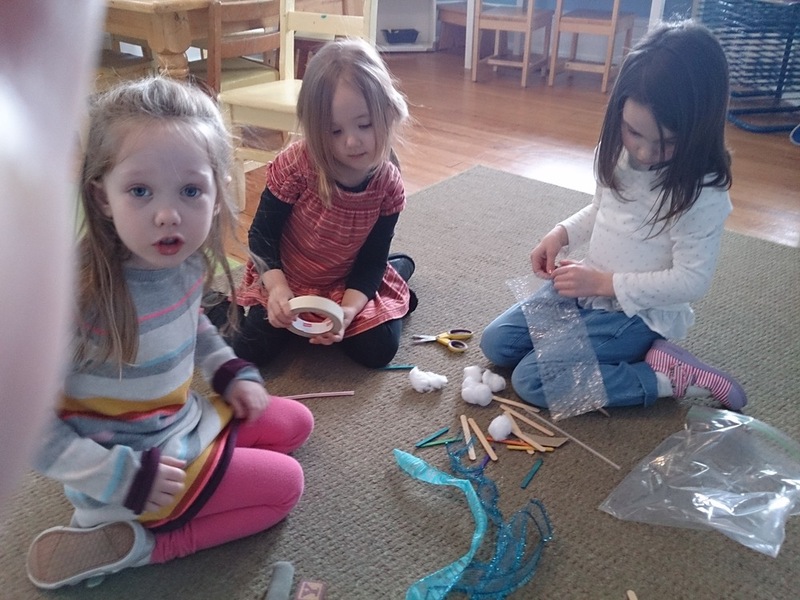 We took the forest animals, as well, to build homes for them so they wouldn’t all have to cram into a mitten! The Fireflies practiced making patterns this week with circle stickers. 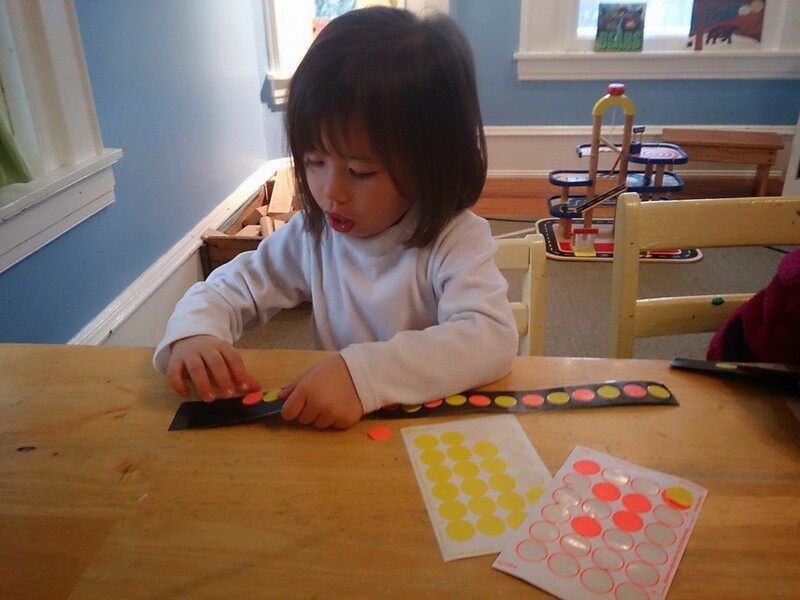 The children looked at a repeating pattern of stickers, a sequence that goes and then repeats itself over and over again, and duplicated the pattern on a long strip of paper. 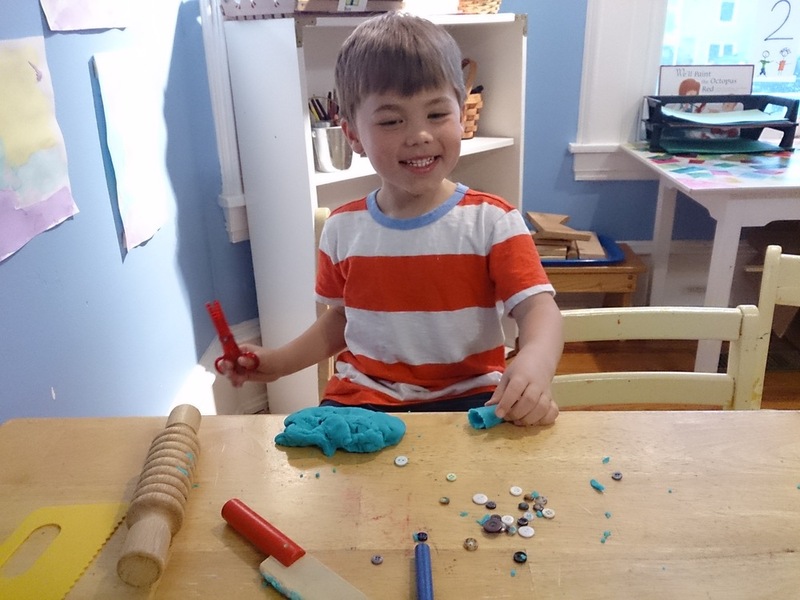 In preschool, identifying and creating patterns is just the is one of the building blocks to future math skills. In the coming weeks, we will explore other Jan Brett books, comparing and contrasting the stories & characters and doing exciting activities based on her books. How many tubes are in our shape? The art center is a popular place! Three weeks ago, I noticed both class were interested in spiders, the MWF class was finding spider webs on the playground and the TR had become interested in Daddy long legs. To introduce the topic, we read the Very Busy Spider by Eric Carle. 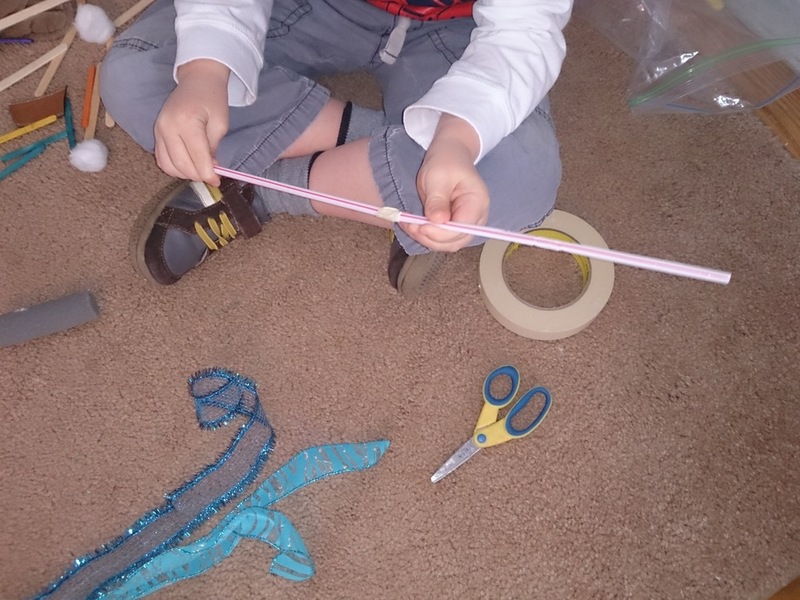 Then we tried to build our own webs with yarn on the classroom chairs. The children problem solved to wrap the yarn around the legs of the chairs so it wouldn’t slip and make their web in the empty space between the legs of the chair. By the end, the Fireflies appreciated the work of the very busy spider. Two graphs are hanging in our room; each class was asked, “Do you like spiders?” and “Do you like you like arachnids?” and their yes or no answers were recorded on the graph. The interesting twist was the Fireflies didn’t know what the word arachnid meant! So when they were told that arachnid is the scientific name for spider, they quickly realized the graph needed to be changed to reflect their new knowledge. The Fireflies were extremely excited when the Kindergarten found a Marbled Orb Weaver, a beautiful orange spider with a huge abdomen. It even built a web in the observation container! We discussed how a spider uses non-sticky building lines to assemble the structure of the web and sticky lines to catch insects. 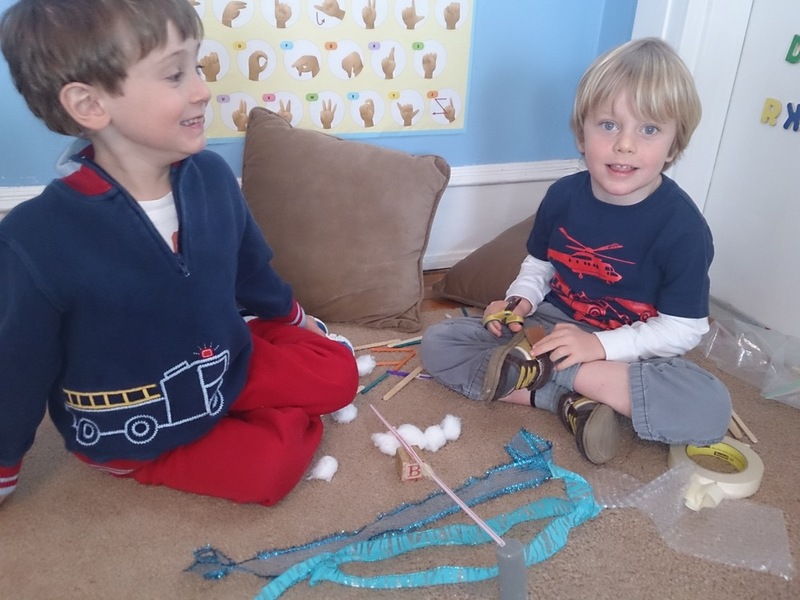 We used non sticky string and sticky wiki sticks to build our own web at Circle Time. We pondered if our web would catch a fly and sure enough after lunch, a pesky fly was stuck in our web! The Fireflies have been building there own webs during free play with the same materials. After both the MWF and TR classes had seen the Marbled Orb Weaver we decided the best place to release the spider in the garden. The Fireflies have become master experts at finding spiders and having observed several spiders up close, we are now learning the body parts of a spider: cephalothorax(a fused head and thorax), abdomen, two fangs, eight eyes, eight legs and a spinneret(produces the silk thread that builds a web). We are in the process of building are own spiders, choosing colors for each body part and using our observation skills to draw “exactly what you see.” We even named our spiders and the pictures will be assembled into a class book.! Check out our new game this week. Each child takes a turn to roll the die, moves the corresponding number of leaves from the top of the tree to the pile at the bottom. When the branches of the tree are empty, a group of children gets to jump in the leaves. The Fireflies have no idea they are practicing math skills and social interaction as they play! 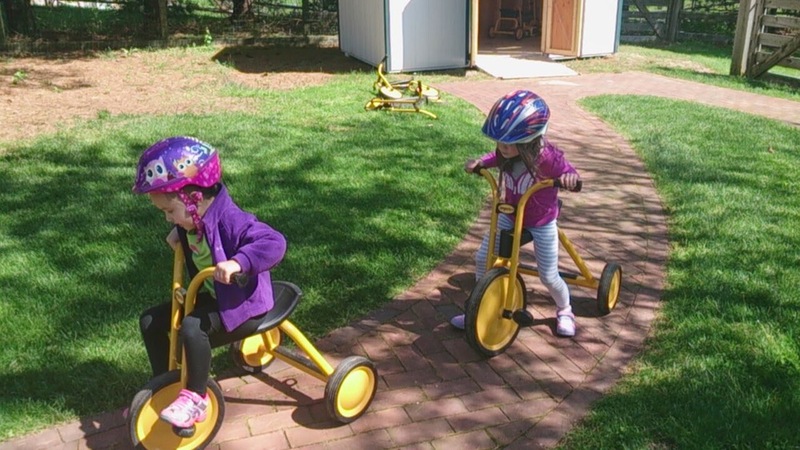 Rainy days can still be fun and it doesn't mean the Fireflies are stuck inside. Before the Tuesday/Thursday class braved the elements, we laid on the floor with paper and markers; everybody spread out on the carpets, asking each other for different colors, looking at each others drawings. It was a cozy way for all of us to interact, appreciate and share with each other. Then we donned our rain gear and headed out into the pouring rain. We placed our drawings in the grass to observed what the rain did to our artwork. 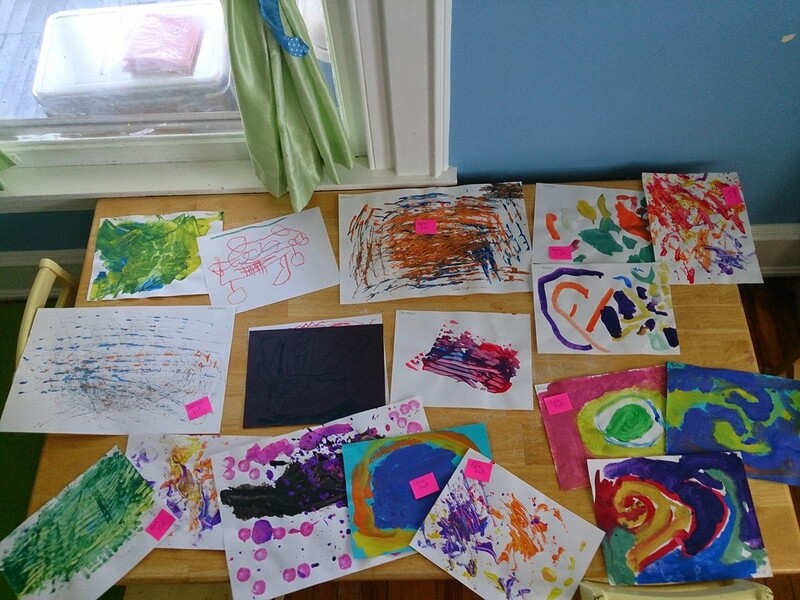 As the raindrops hit the paper, the colors slowly spread out and started to mix, soon we scooped up our drawings and took them inside to dry. Once dry, we discussed how the rain changed our artwork. The next day the Fireflies hung their artwork on the wall and they can't wait to show you their Rainy Day Experiment! Roller coasters were a topic of discussion for a few days in the Firefly room. 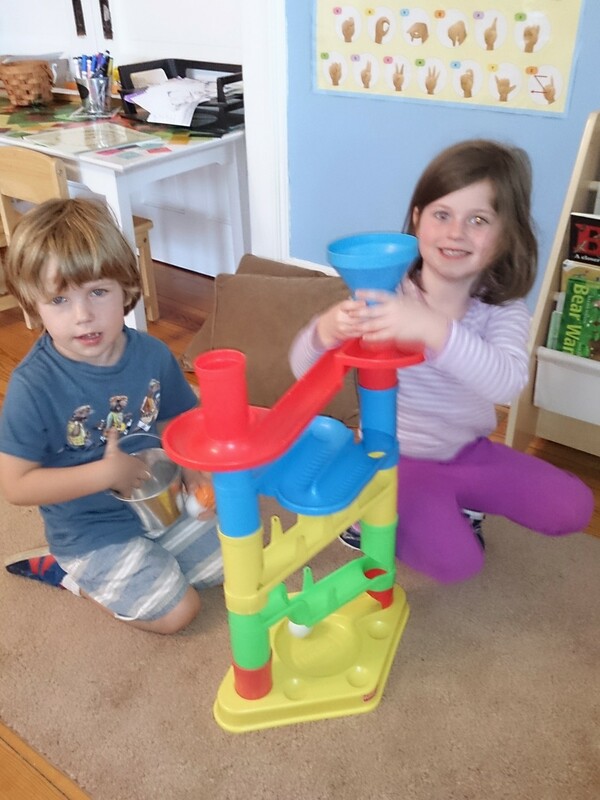 The children decided they wanted to build one. 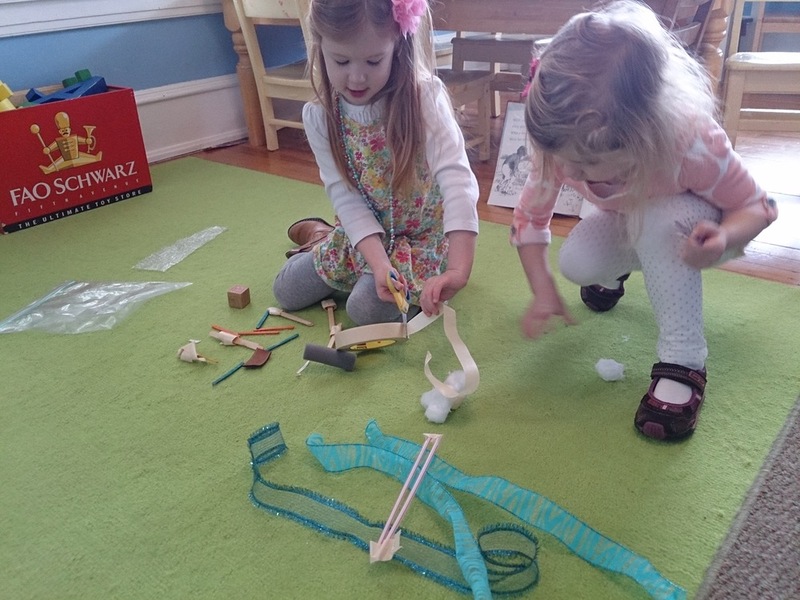 Assembling a ball track toy became our "roller coaster challenge." Two children were paired up to figure out how to fit all the pieces together, it was harder than it looked, as it took each pair of children 10-15 minutes to complete the task. 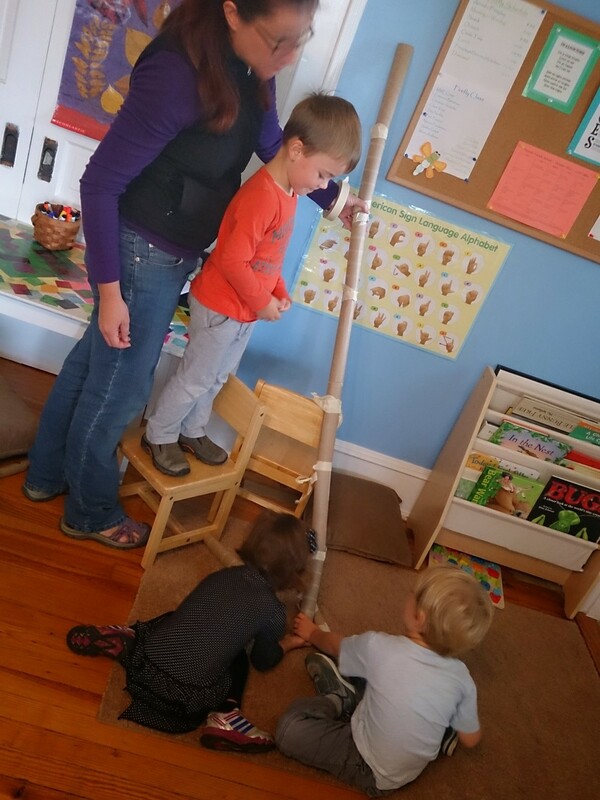 Team work, problem solving, and listening skills were developed as the track grew taller. The Fireflies exercised those skills to a greater degree when they designed their own roller coasters with masking tape and paper towel tubes! 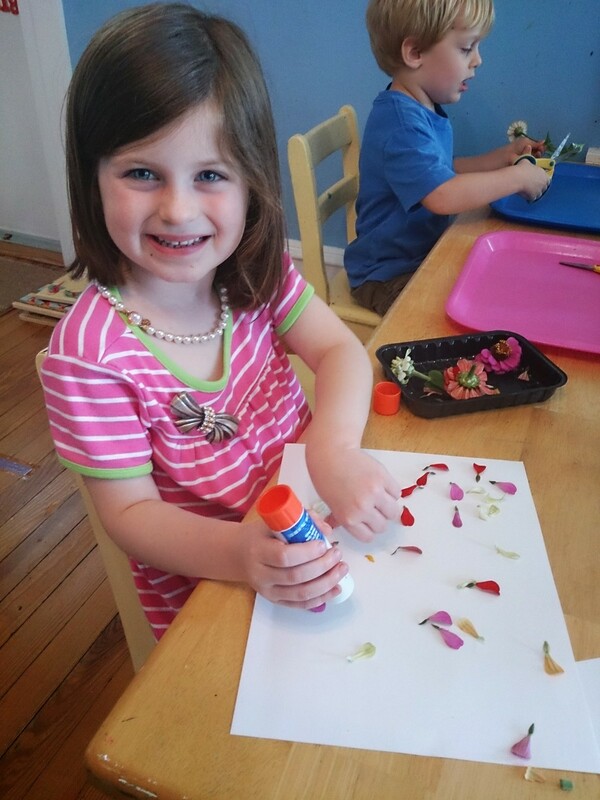 The first few week of school, we explored flowers by dissecting, cutting, painting with them, and making bouquets. 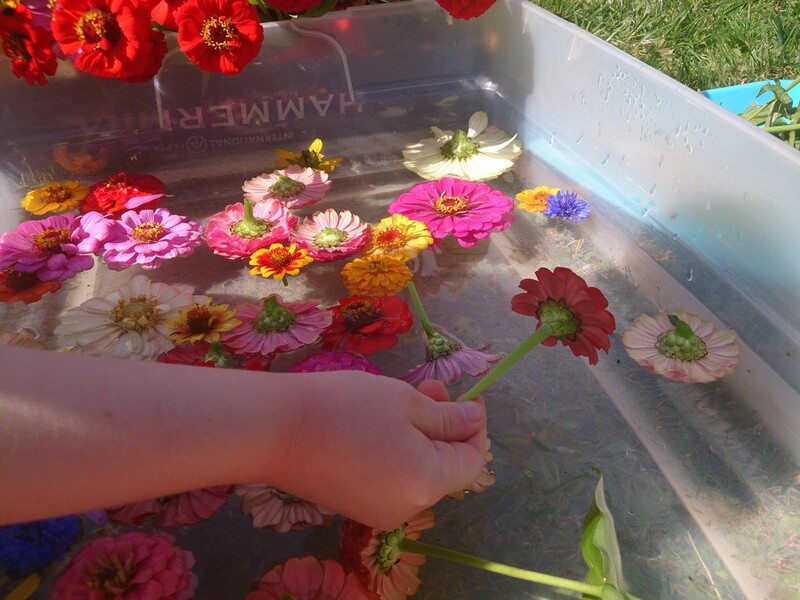 When one of the children was placing flowers in a bowl of water he noticed the flower blossom was floating on the surface of the water. He called his classmates over to witness the discovery. The next day, we explored this concept further outside with a tub of water and a plethora of flowers(Thank you, Laurie!). The Fireflies discovered the blossoms float right side up and upside down, with stems on and off, and big and little leaves floated as well. After each child a turn floating flowers till their hearts were content, we gathered as a group to learn about and design a flower mandala. The word "mandala" comes from a Sanskrit word that generally means "circle," and mandalas are primarily recognizable by their concentric circles and other geometric figures. The shape symbolizes many qualities such as unity, wholeness, perfection and divinity and has been prevalent in most cultures around the world. In this guided activity, The fireflies learned to repeat colors and designs as we tried to build concentric circles. We paused at the end of the experience to admire the simple beauty of out flower mandala. 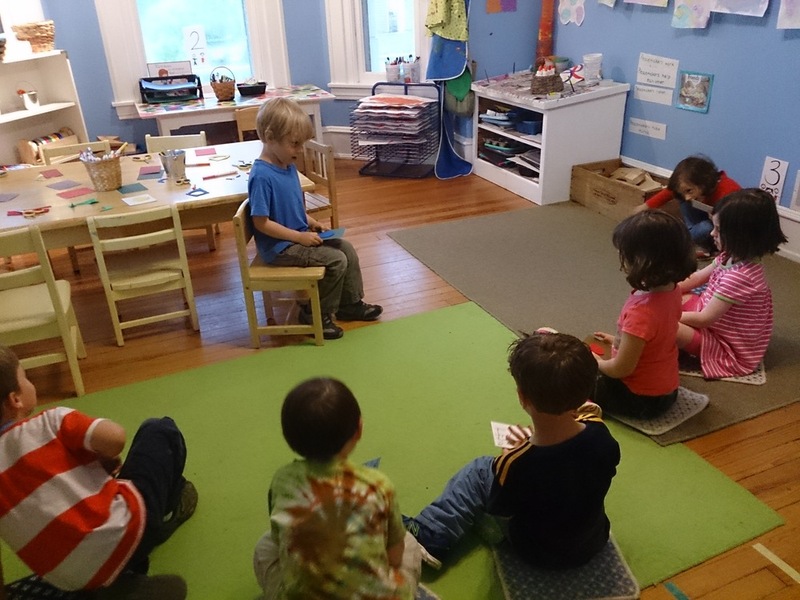 Learning how to say goodbye to mom or dad is part of the preschool experience..
Our whole school gathers together each morning to "bring down the silence." Meeting for Worship is the heart of our school. 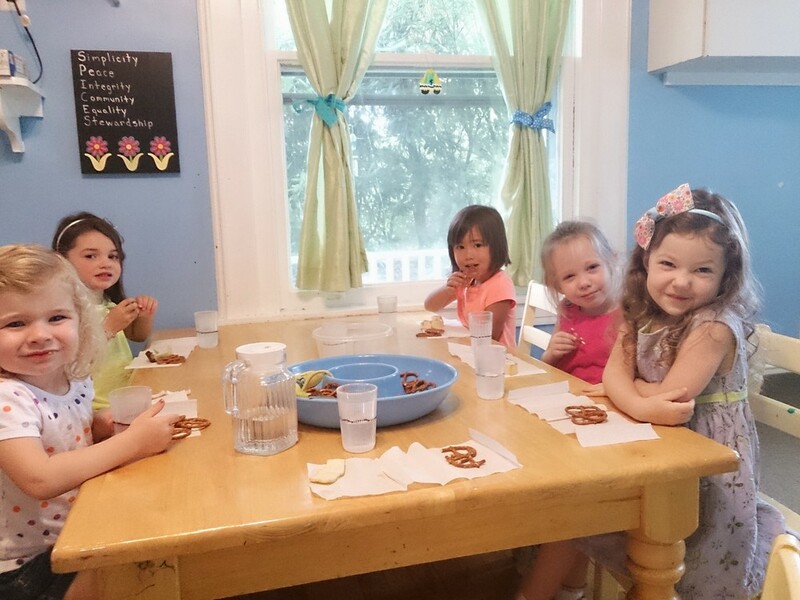 During snack, we learn how to listen and converse to our classmates. We try to always use our "Please and Thank you's." We also learn independence and responsibility as we tidy and clean up our spot at the snack table. Many friendships are forged in the FFS Taxi. During Circle Time, we learn about our current topic of study. Eating together is a special part of our day, and we might even try a new food. 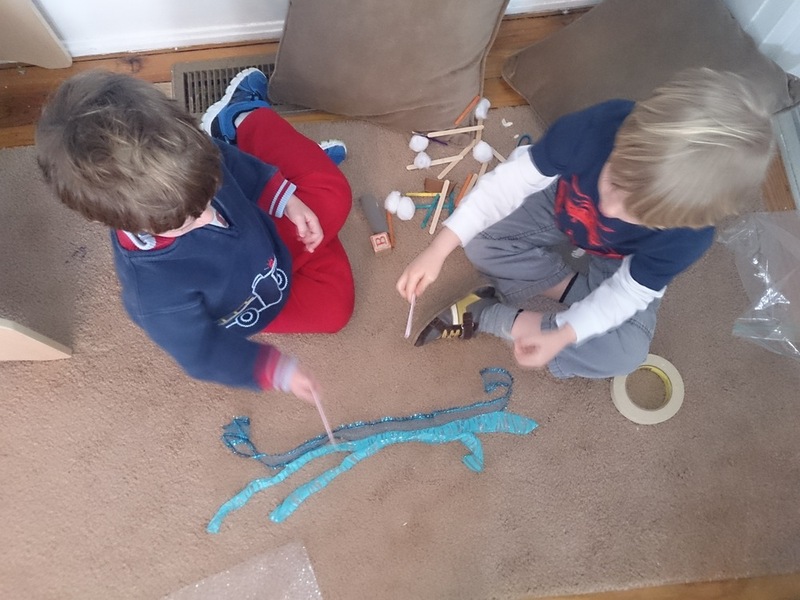 An art activity is often available during Free Play as well. Imagine your child's face if you pulled up in Pick Up Line in the FFS Taxi ! This week the Fireflies are making new friends and learning the routine of our classroom. 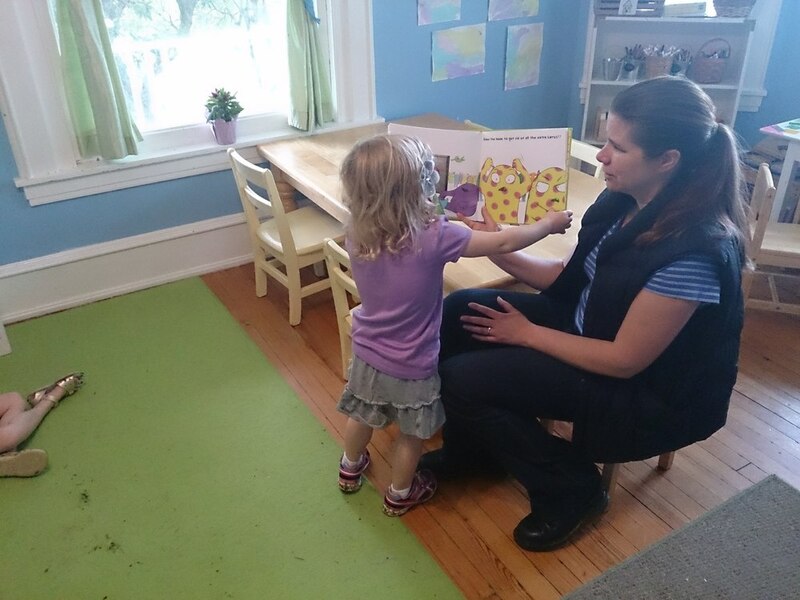 At Meeting for Worship, Sharon read books about listening, preschool activities, making friends, and knowing you are loved by a parent even when you are at school without them. Those themes were carried over into Firefly room as well. The Fireflies are learning how to say goodbye to mom or dad, many for the first time. The children are enjoying learning our daily routine and are already remembering what comes next. 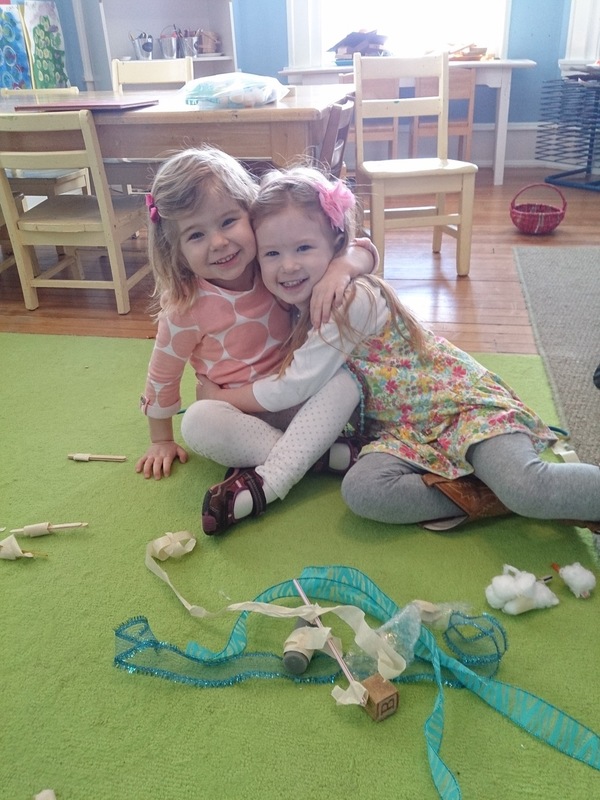 The activities during Circle Time and Free Play are helping us make new friends. Many of our activities revolved around learning each others names and learning how to begin a friendship. At Circle Time we played a game called Meet GLOW; our classroom mascot. GLOW was introduced to the children but he had to learn the children's names. GLOW was passed around the circle as music played, when the music stopped, the child holding GLOW stood up and said their name. This was a fun and exciting way to get to know all of the Firefly friends; ask your child to introduce you to GLOW at your next drop off. During Free Play, we played a board game, Hand in Hand, that encouraged the children to use observation skills, turn taking, and following directions. 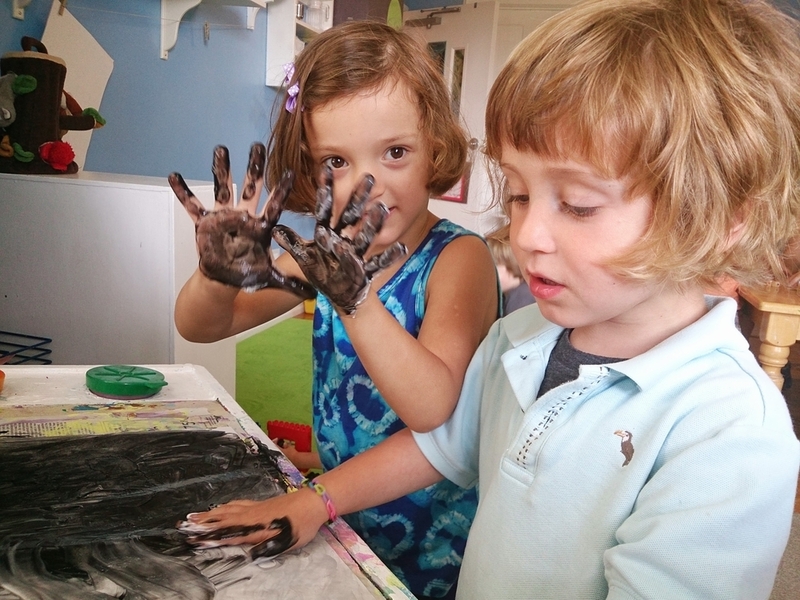 At the art easle, two children were paired with each other during Friendship Finger Paintings. 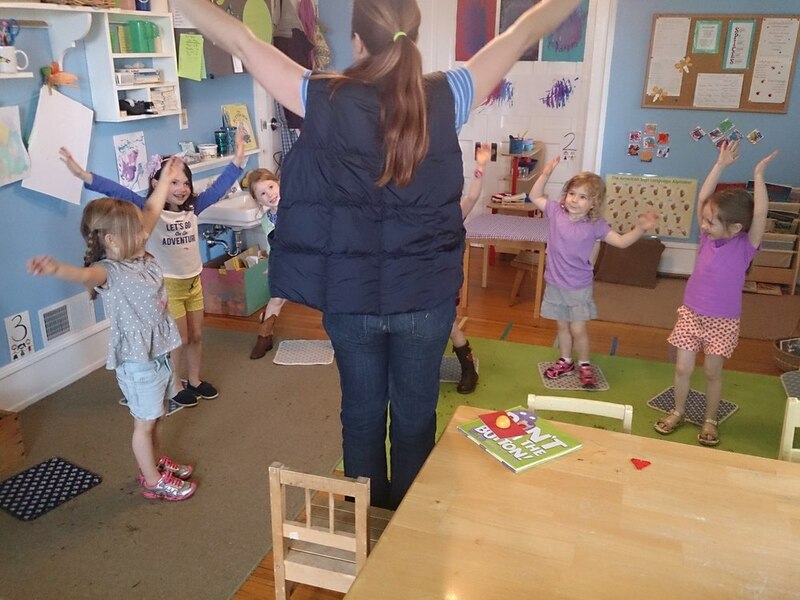 Each child greeted the other child at the beginning of the activity as modeled by the teacher. 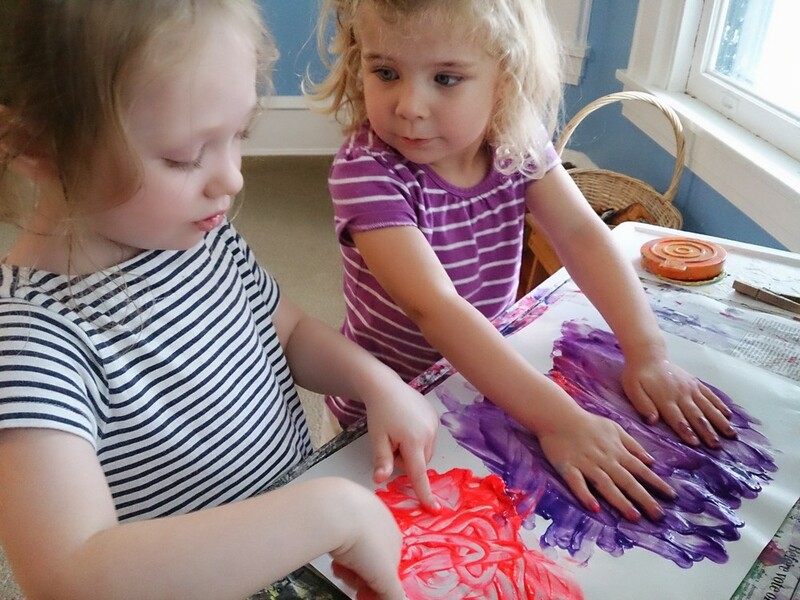 Each child got to choose their finger paint color and painted on the same piece of paper beside their newly introduced companion. 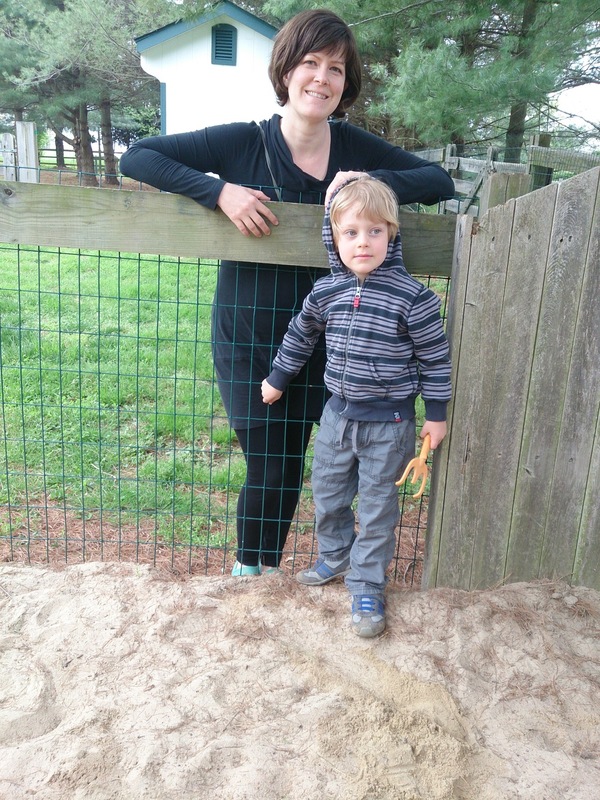 We visited our garden this week and picked sunflowers that were taller than Meaghan! Laurie brought in beautiful flowers from her home garden for the Fireflies to dissect, and the children were engaged with exploring petals, stems, leaves in our Flower Cutting Station. Could this be the beginning of a study topic? 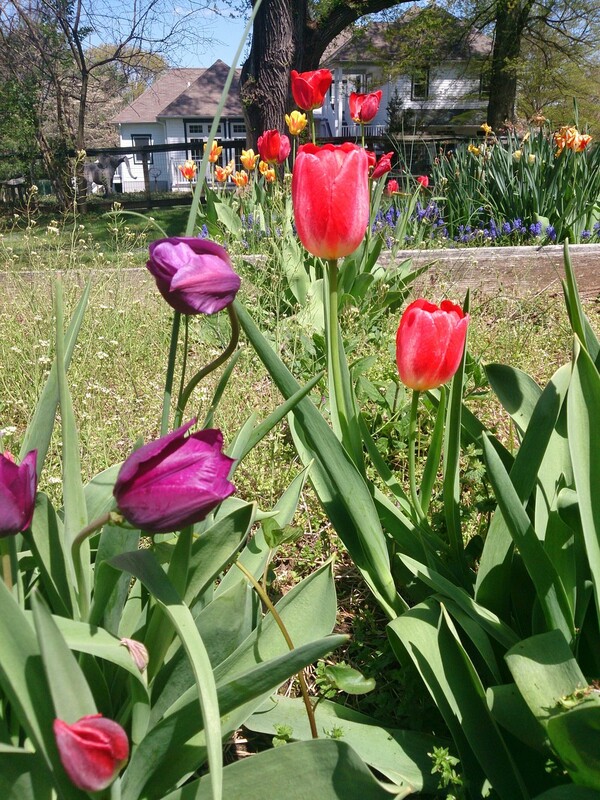 We had so many flowers that I am actually wondering if Laurie's garden is bare! The children thoughtfully picked out a flower to bring home and every child cut, dissected and sorted flowers till their heart was content and still we had a plethora of flowers! 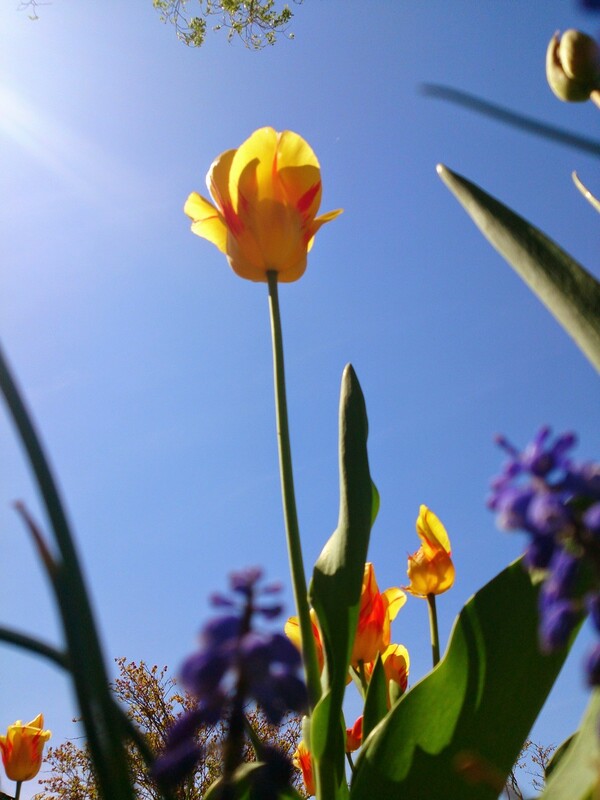 I posed a two queries to the MWF Fireflies...How do flowers make you feel? (Happy) ....And what to do with all of our beautiful flowers? After a lengthy conversation, the Fireflies decided to give flower-filled vases to the other classrooms at Fairville and we quickly delivered the Happy Flowers before the end of the day. The first week of school was exciting and filled with new experiences, I look forward to getting know your children as we grow, learn and laugh together.